This is based on a sample provided by the winery or a company representing them. 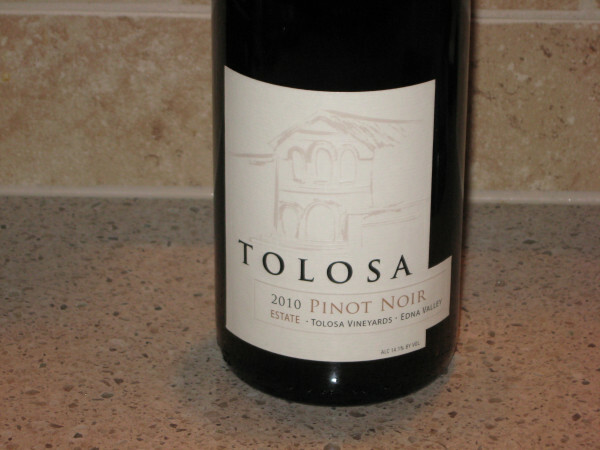 Tolosa’s name reflects the long history of winemaking in the Edna Valley Appellation. Over two hundred years ago the friars at Mission San Luis Obispo de Tolosa began the first vineyards in the county. These early wines were highly valued throughout California. Today, Tolosa honors that legacy by producing remarkable wines from this small coastal wine region. The first vineyard plantings in early California came with the establishment of the missions. The vineyard at the Mission San Luis Obispo de Tolosa was the first planted in San Luis ObispoCounty and was situated in what is now the EdnaValley appellation. Original documents show the quality of wine produced from this mission was highly valued and often traded to other missions. In the 1870’s, Pierre Hyppolite Dallidet grafted French cuttings onto the rootstock still surviving from the mission era. Some of the original rootstocks survived prohibition and are part of the EdnaValley appellation today. Like the Burgundy region of France, the valley has balanced hot days with cool nights, and challenging soil. The weather conditions prove ideal for producing grape clusters that are fewer in number, but linger longer on the vine to yield flavor of exquisite intensity. The tradition at Tolosa is the commitment to evoke the natural sophistication inherent in the grapes in the EdnaValley. We focus on Chardonnay, Pinot Noir and Syrah varietals that yield the most intense results under our growing conditions. We follow a slow handcrafting process that nurtures the wine through periodic gentle racking and minimal filtration. We allow nature to determine the character of each vintage. This is the way California’s winemaking heritage first began, and this is the way it will always be at Tolosa. Tolosa practices scientifically based sustainability practices in their vineyard and winery. To summarize – sustainability is a comprehensive program that encompasses hundreds of the best management practices in the winery, vineyards, employees, and with neighbors. In August 2009 Tolosa converted to solar electrical generation with SunPower Corp. This system will provide the winery’s electrical energy for the next 25 years. All of Tolosa’s Vineyards are SIP Certified, demonstrating Sustainability in Practice. All winery waste including grape seeds and skins is recycled, composted, or otherwise recovered. We use vineyard tools with tractors designed to do multiple tasks at the same time. This minimizes the number of tractors traveling through the vineyard and significantly reduces fuel, soil compaction and erosion. We utilize cover crops that reduce erosion, build soil fertility, and provide habitat for beneficial insects. We have integrated pest management practices in place that carefully monitor the balance of insects, soil fertility, soil moisture, and vine health to minimize the waste of energy and chemical inputs. These practices make use of natural predators to control insect pests, and even weed species in some cases (we actually release a specific beetle which eats the seeds of star thistle.) We also utilize non-pesticide management methods, like using the Vine Mealybug’s own pheromones in small playing-card size clips hung on the vines, to confuse them during mating and as a result lowers their populations. Every drop of water that we use in the winery is recovered and biologically processed until all the water is utilized a second time through the drip systems to water the vineyards. All the vineyards are irrigated with low volume, low pressure drip irrigation placed at each individual vine to minimize the waste of water and maximize uniformity of vine growth. Root stocks are chosen for the vines to resist insect and disease issues while minimizing any chemical or energy inputs. We use low-risk fungicides in protecting our crop from fungal diseases. For example paraffin-based stylet oil (an organic product) is one of the many effective ways we control powdery mildew. In the month of June, just after the young clusters have gone thru bloom and set, the leaves around the clusters are removed and the growing shoots are positioned upwards to passively minimize botrytis and mildew pressure, which reduces the number of protective sprays and increases the effectiveness of those sprays when required. We leave wildlife corridors and erosion offsets along creeks, with native plants remaining in place. Our winery’s refrigeration lines, hot water lines, exterior wine tanks, walls, roof and doors are completely insulated. The wine industry’s most efficient presses and refrigeration equipment were built for Tolosa. Our night time sensors monitor the temperatures inside and out, utilizing nature’s cool night air with a series of automatically opening vents in the ceiling and low maintenance fans in the walls. Each and every permanent wine vessel in the winery is individually controlled with their own thermostat to minimize lost energy. This is my first experience with a wine from Tolosa and I am looking forward to giving it a try. The winery’s commitment to sustainable farming practices shows they care about the quality of fruit going into the bottle and put their money into protecting the environment. The wine is 100% Pinot Noir from the Tolosa Estate in the Edna Valley AVA. This is a blend of the D667, D115, 2A, and Pommard clones. The wine was aged 11 months in 225L French oak, about 1/3 new. Total production was 4,450 cases and the alcohol is 14.1%. The Suggested Retail Price of the wine is $30.00. This is a very food friendly wine that will pair nicely with a large variety of dishes. This would pair nicely with poultry, fish, and dishes with a creamy, rich sauce. 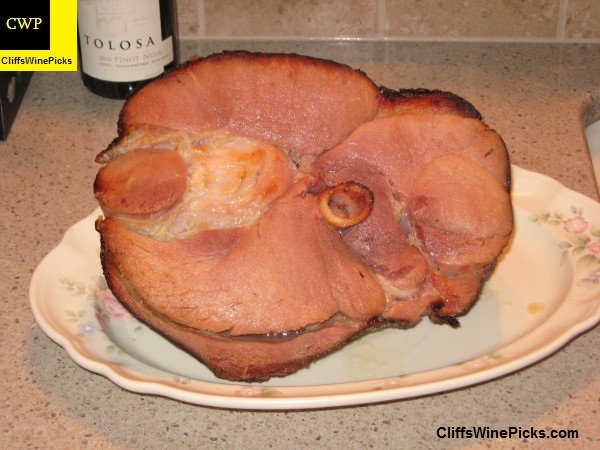 The wine was a perfect pairing with the ham, macaroni and cheese from my wife, and some quickly sautéed asparagus. Delicious! The good acidity cut through the juicy ham and the rich macaroni and cheese and the slight herbal note was perked up a touch by the asparagus. This was a very nice pairing in our house.